The RPG Blog Carnival this month is about game cartography. 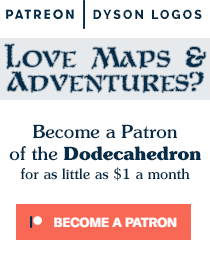 If you would like to join the Carnival, just post anything to do with RPG cartography to your blog and then send me a link and I’ll post it in the end-of-month Carnival Roundup. My geomorphs always continue to amaze me. Every time I log into the blogosphere I run into someone else making geomorphs using the format I put together for my 100 Tile Geomorph Challenge. But the best of the best is what Dave Millar has done with them. I’ve mentioned his mapper before on the blog, but if you haven’t been there lately, then you probably haven’t seen how the geomorphs just keep growing. There are over 300 geomorphs in Dave’s mapping machine now, and more get added every week. The mapper has also added great new functionality – the ability to not only rotate pieces, but selectively remove the ones that just aren’t working for you. All this with a jazzed up user interface and a new domain (davesmapper.com). So go check it out – instant dungeon maps are only a click away. This is post 4 in the A to Z Blogging Challenge – D is for Dave’s Mapper. Very cool stuff. I love geomorphs. I still have my Basic D&D book of blue geomorphs. We used those a lot! Congrats on your idea taking off like it has! Shouldn’t the title be “…four (or 6, 8, 10, or 12) at a time”? Actually you *are* permitted to make a 1×1 map in the mapper. I’m not entirely sure I endorse that idea, but you’re welcome to it. Yeah, Stoneworks did a full set of those, they are GENIUS. I’d forgotten about that. Thanks for the reminder.